Long tongs are useful at salad bars and in the commercial kitchen for reaching into places shorter tongs can't get to. With the Winco PUT-9B Polycarbonate Utility Tong, Beige 9" you will be able to reach into deeper salad crocks and larger serving platters with ease. These long armed plastic tongs feature a scalloped grip serving end that not only reaches into deeper pots, but can also grasp foods easily for a simple transfer of food to your plate. 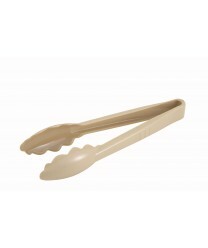 Make sure to have lots of polycarbonate tongs on hand for quick, sanitary and efficient food service.